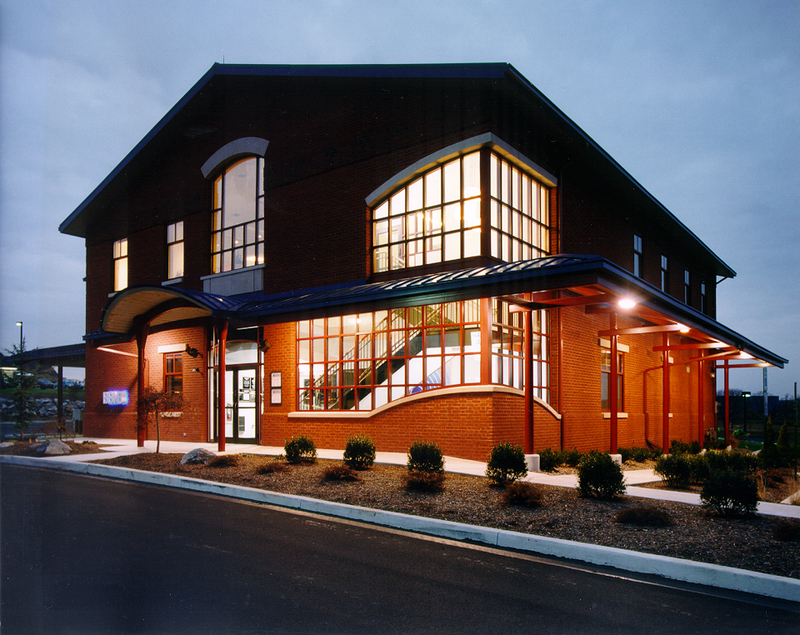 A combination of sculptural roof shapes, large expanses of glass, exposed interiors, artistic curves, and a rich brick façade make this new building a high-impact, award-winning design for the bank’s expansion into Berks County. The rich combination of colors and materials give a lift to the entire surrounding area, pleasing neighbors, passersby, and customers alike. As the centerpiece and anchor of the bank’s growth in a new area, it creates an enticing and inviting destination to the community, attracting new customers and clientele for the full scope of financial services. 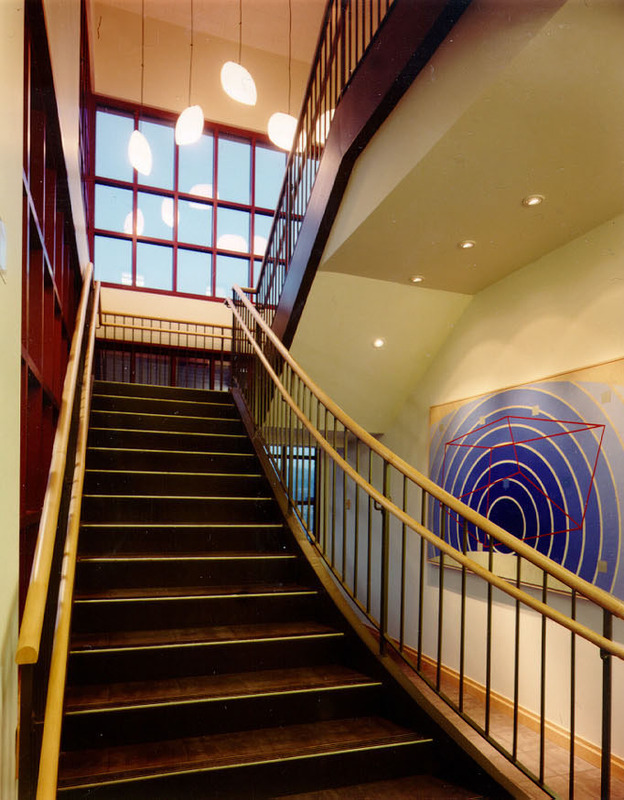 The sweeping staircase is the most dynamic interior feature. It flares at the vestibule area as it draws customers to the second floor loan offices. The gorgeous wood stair treads, double handrails, and dark baseboards belie the fact that this staircase meets all safety standards for an exit stairway. 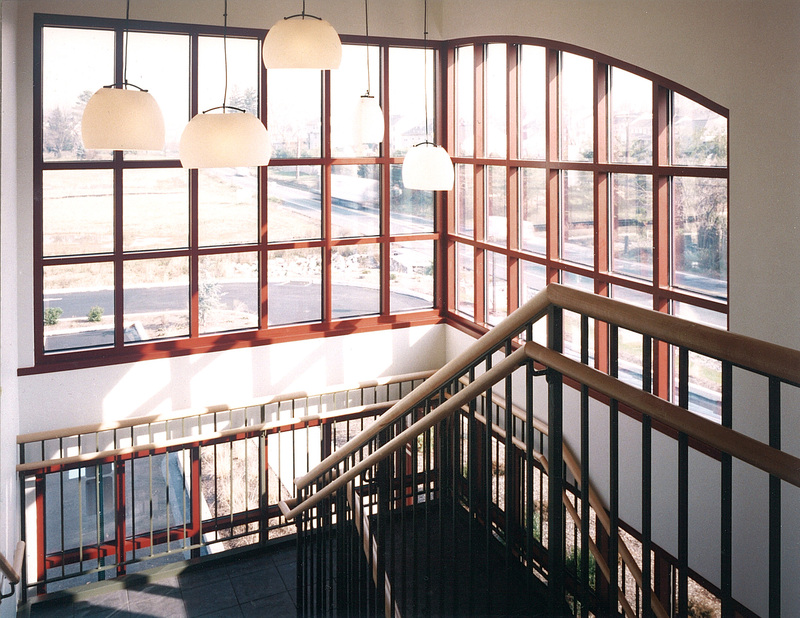 The corner expanse of windows at the staircase landing provide a panoramic view of the surrounding area. Panes in the windows reflect a historic element of surrounding buildings, while a multi-level cluster of pendant lights is an artistic display that augments the natural light, with globes that mirror the curved angle of the windows. Modern art is a consistent décor element used throughout the building where it adds vibrant color, fascinating images, and a contemporary quality that is both soothing and engaging. All art was commissioned specifically for this building. Here it on full display as a customer fills out paperwork at the writing desk prior to going to a teller window. The lowered curved ceiling over the desk is a design feature that gives this otherwise open area a comforting, intimate feel. 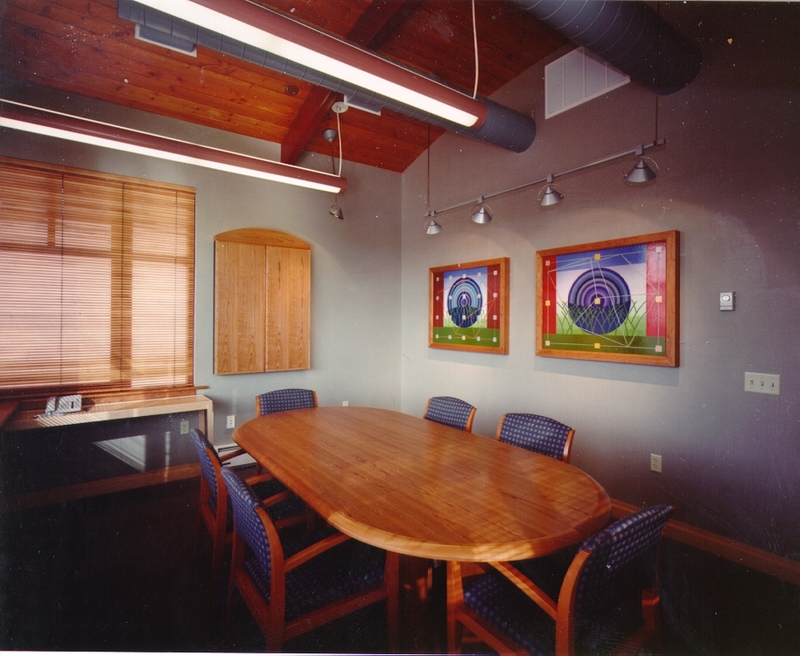 The pitched wood roof in the second floor conference room is a unique feature that differentiates this space from other areas of the building, adding rich tones that are repeated in the furnishings. 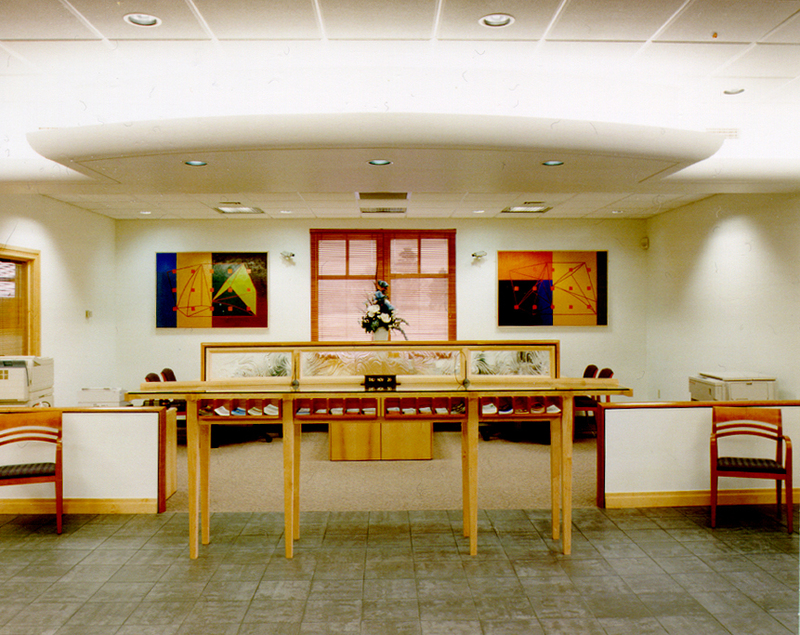 Linear lighting illuminates the meeting area while adjustable lighting showcases the artwork. Colors in the art are reinforced in the fabric of the chairs. 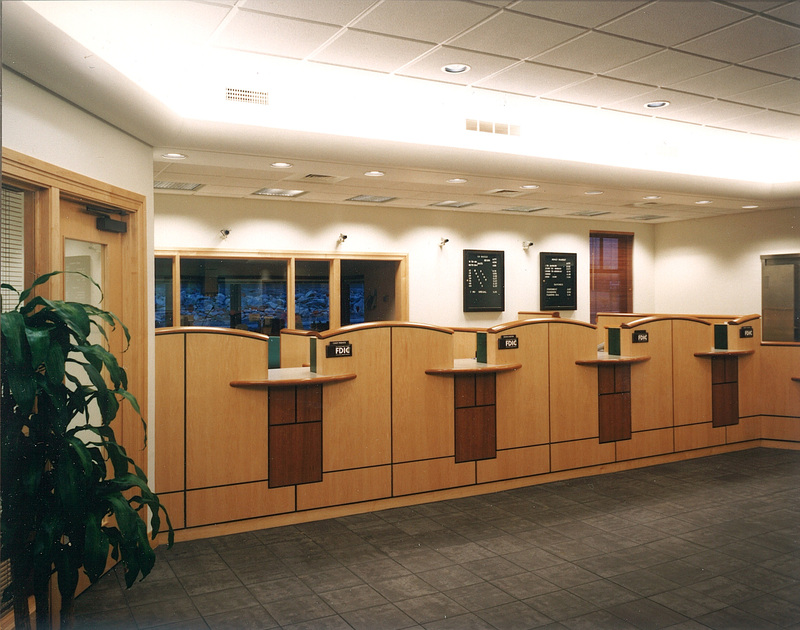 Teller windows at this new location reflect the same designs, use of cherry and maple woods, and openness to the vestibule area established as the consistent look for branch offices in other areas. Arches separating the teller windows are consistent with the curved features throughout the interior and on the façade.